Recommended for: Teens + All active individuals. ‘Ancheer’. Sounds a lot like an Indian mispronunciation of an English phrase. Consequently, our expectations weren’t high at all. However, turns out we were wrong in all our jingoist glory. We kid, of course. 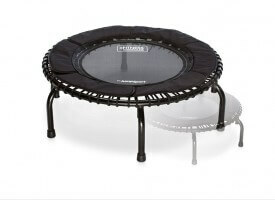 This is a true piece of a rebounder that we wholeheartedly recommend to most active individuals. Let’s start off with the design. We tried the drab and bland black version, but you don’t have to. 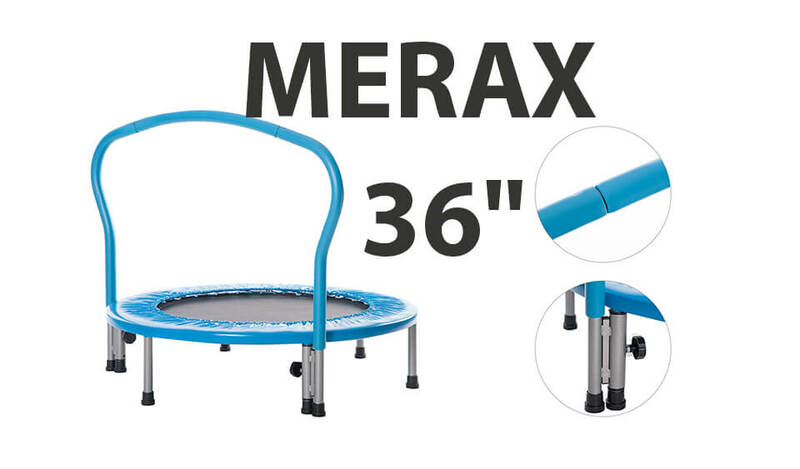 The trampoline is available in a variety of colors – blue, grey and our favorite, red. It doesn’t look cheap any way you slice it, so there’s that. 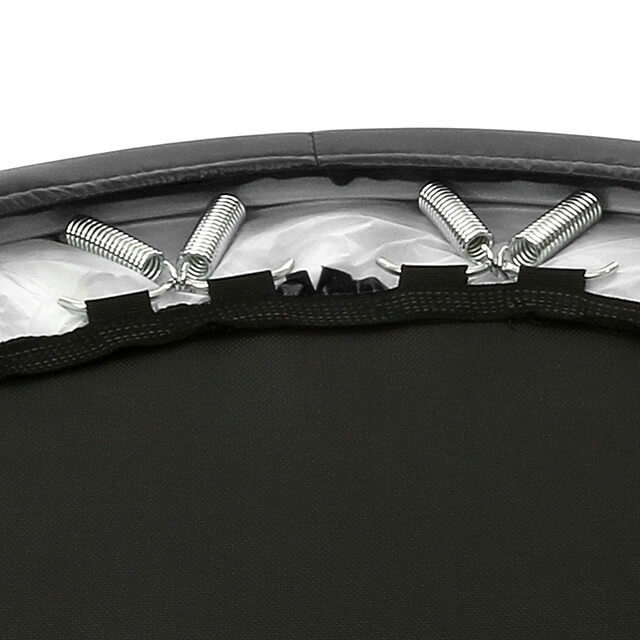 You get seven legs that keep the rebounder stable and a diameter of 40 inches. This is about as large as rebounders get. A smaller, 38 inch model is also available and it’s somewhat cheaper. The 1164 sq. in. of jumping surface is held in place with 34 impressively thick springs for the price point. They make for a good, solid exercise. Bounce height is somewhere in the middle – not too high nor too low. The mat appears to be durable and long-term owners’ experiences corroborate that. Don’t expect the softness of premium brands, though. There is ample stitching holding the mat and the springs. It should last for a while. This is where most budget rebounders fail first. 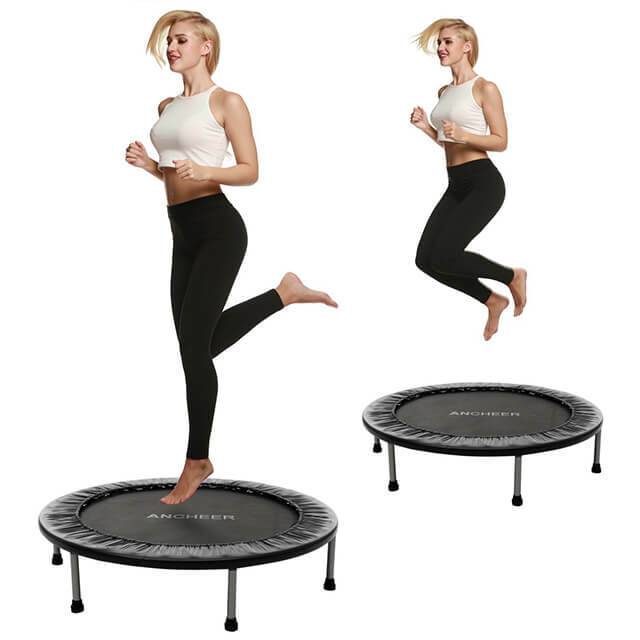 This mini trampoline comes with a 220 lbs. rated weight limit and we advise you against exceeding it – you could bottom out. The trampoline itself is about 9 inches high. The assembly is ridiculously easy. The whole thing comes practically assembled and you have to set up the legs and the safety pad. It’s lightning quick, really. It supposedly has a 1-year warranty, but good luck with that. Fortunately, the build quality is good so you probably won’t be needing it. The instructions provide an endless source of entertainment if you enjoy seeing the English language butchered extensively and systematically. Sadly, the manufacturer decided to cheap out on a carry bag. 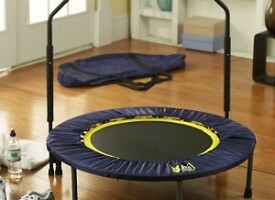 Not much point in having a foldable trampoline then. It’s not heavy – some 12 lbs, so it’s easy to carry. It’s not difficult to fold as well; folding isn’t an exercise that would put Arnold Schwarzenegger to shame as it is with some other rebounders. Handlebar also isn’t an option with this, not even as an aftermarket add-on. There’s simply nowhere to put it. 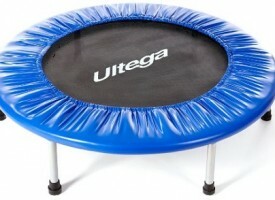 Overall, this is a very capable exercise rebounder. You can consider it as a budget version of Dave Hall’s Cellersizer – sans a gigantic markup, of course. 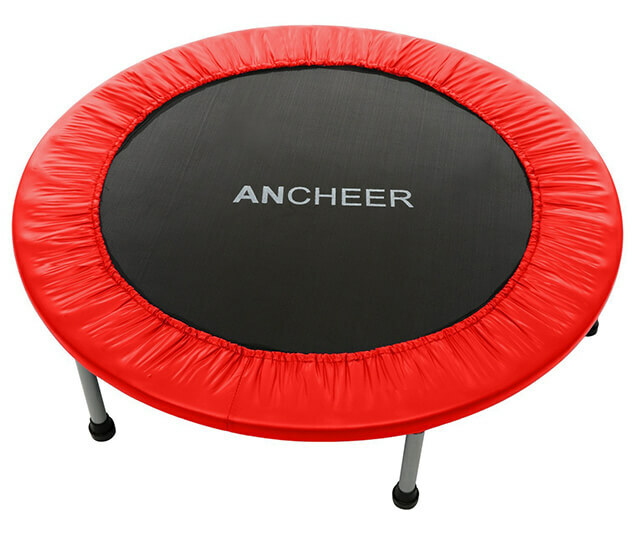 We were happy with this trampoline and a mini rebounder like this can serve many undemanding customers for a long time without breaking. Hence, it gets our seal of approval. Highly recommended! 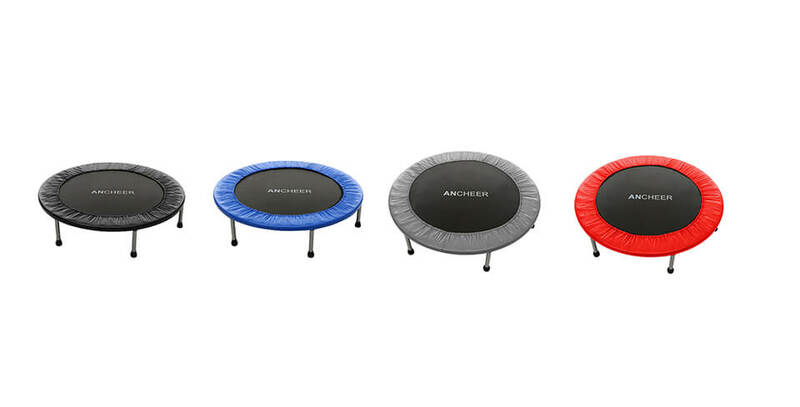 Check our selection of best mini trampolines for 2017. Very interesting rebounder which really caught us by surprise. First of all, good quality materials. Second, bouncy springs and medium soft mat. Third, customer support actually exists. Definitely rebounder to consider. ProTrampolines Out.